Before I tell you about one of my favorite shows, I wanted to clear something up. I’m not pregnant. Yesterday’s Spearmint Baby post seemed to have confused some people (who I suspect didn’t read the entire thing) and while I was pregnant, I’m not anymore. Now, I don’t need sympathy; that’s not why I’m sharing. I just wanted to clarify the post and make sure you all didn’t think that was some big announcement. It was just another part of our journey. And I promise, I’m ok. We’re actually very hopeful because now we know it is possible for us to get pregnant. Thank goodness. Last summer, when my husband and I were in Australia, I found MasterChef Australia while channel surfing and watched the last few episodes of the season. I loved it and was sad when we left before the finale aired. Luckily, a couple months after we returned, MasterChef USA came to the states! I watched every single episode of the first season and was so happy when Whitney won. However, I’m no MasterChef. 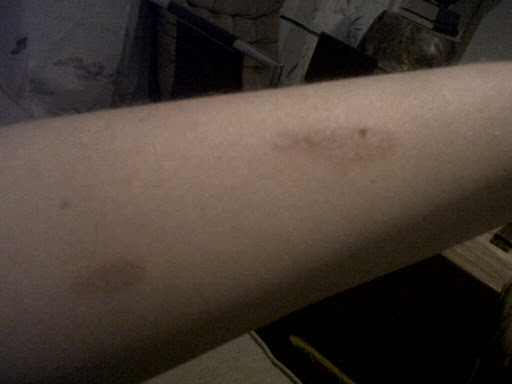 Check out these nasty burns from making my perfect salmon the other night. This picture doesn’t do them justice. They’re really red and bumpy. Actually, that night, I developed a huge white rash of sorts that covered my whole forearm. We were a bit worried and my husband even called his fire fighter dad, but after a few hours, it was back to this. While I might not have a future as the new MasterChef, I’m loving season 2 so far. Almost every time someone makes it through to the next round, I cry. I just love the underdog stories! I’m a sucker for that kind of stuff. Do you have a favorite food-related show? I used to chop onions this way too, until I saw Emeril Lagasse do it much more simply. (I tried to find a link, but didn't) Its starts the same as your, by cutting the onion in half, but you don't make the horizontal cut. When you make the first vertical slices you do so at a slight angle, then just like in yours you slice off from the end and have chopped onions. Not to dog Martha, or MasterChef, or even you, that horizontal cut is probably one of the most unsafe cuts you can make in the kitchen. Make sure your knife is super sharp when making a horizontal cut. now i just want to cook something with onion in it, just so i have an excuse to do it right!and, btw, i'm loving the Spearmint Baby posts – the process of getting and finding out about pregnancy isn't something that happens overnight (for a lot of us anyway), so having your posts stretched out over time feels really…i don't know, organic? realistic? accurate? something about it rings true for me.